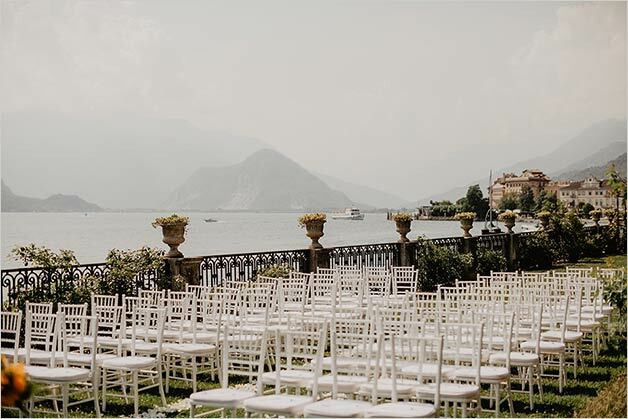 This wedding will be surely featured on it but we wanted to have the pleasure to share this special wedding we planned on Lake Maggiore with our Italian Lakes Wedding readers. 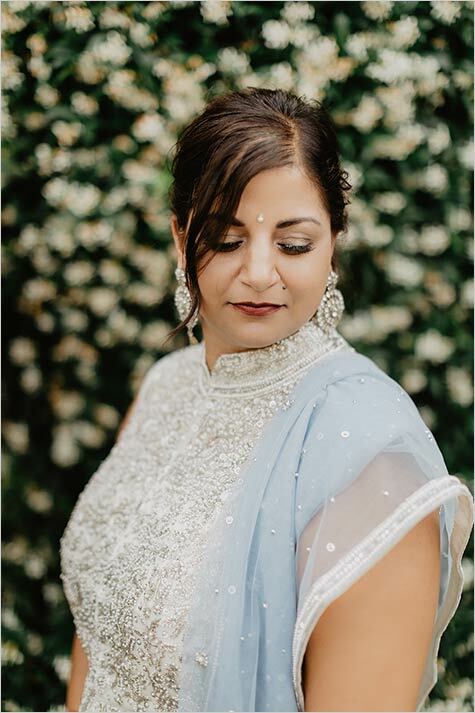 When I met Neera and Amir more than one year ago they were looking for a very special wedding venue for a unique wedding: An Indian Persian ceremony by the lake shore. As the matter Neera and Amir are both Americans living in USA but Neera has Indian roots and Amir is Persian. 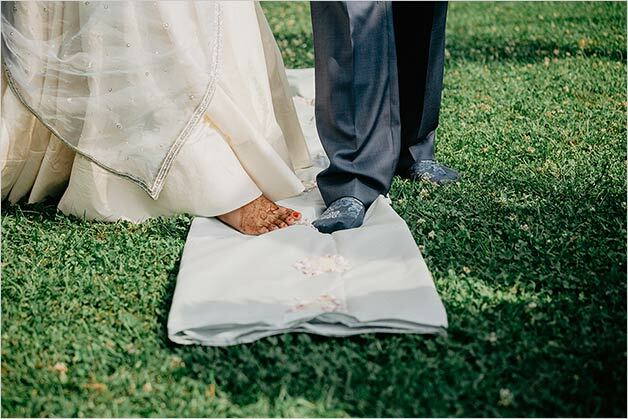 They both wanted to celebrate their wedding creating a very special wedding ceremony that could incorporate both traditions. The final result was amazing! 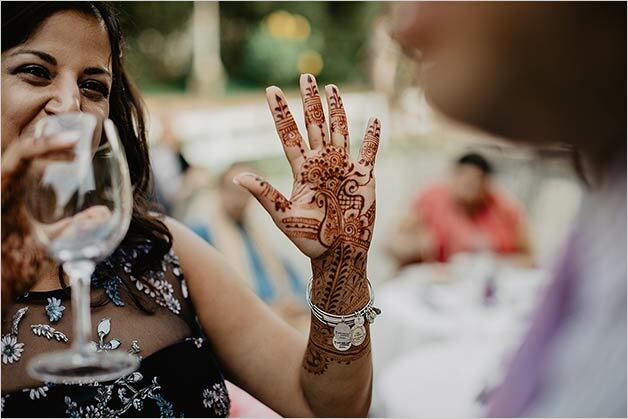 As Indian tradition wants we planned for Neera and Amir a Mehendi party the day before of the wedding. 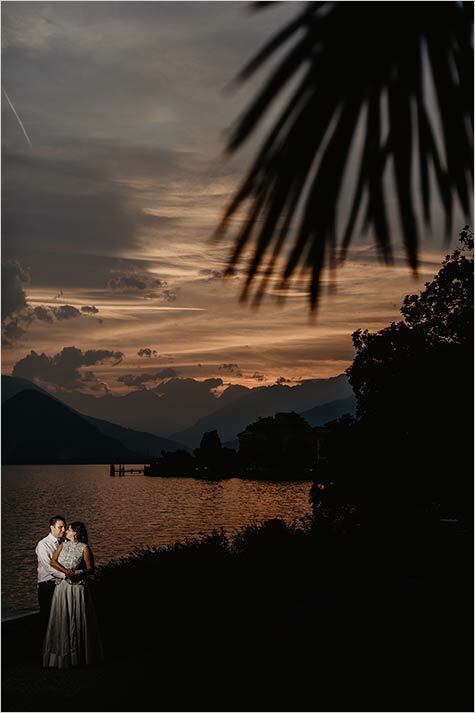 They wanted something fun and casual and we planned the event in a lovely venue by the lake shores in Stresa. 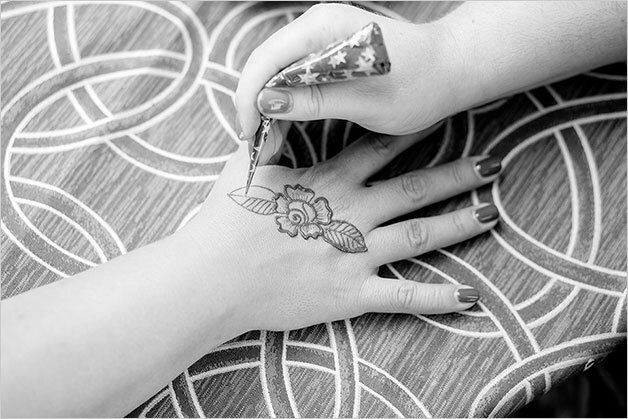 On that evening a very special Mehendi Artist came from Padova to create enchanting drawings with henna on ladies hands. 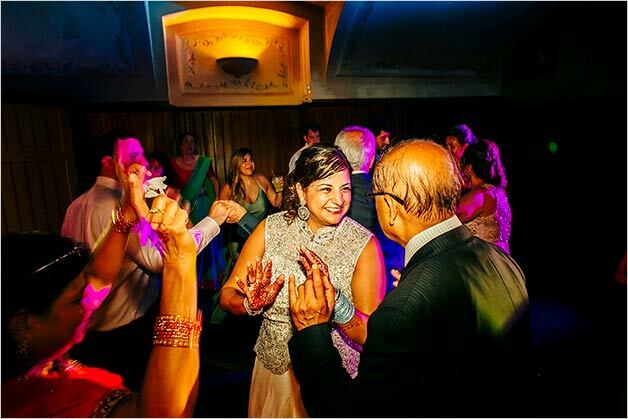 All guests stayed in Stresa so it was handy and easy for all reaching the Mehendi party venue. 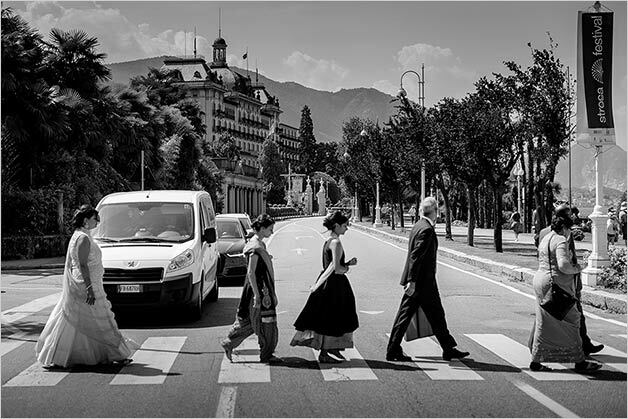 Wonderful photographer David Bastianoni and his Team followed the day before event. 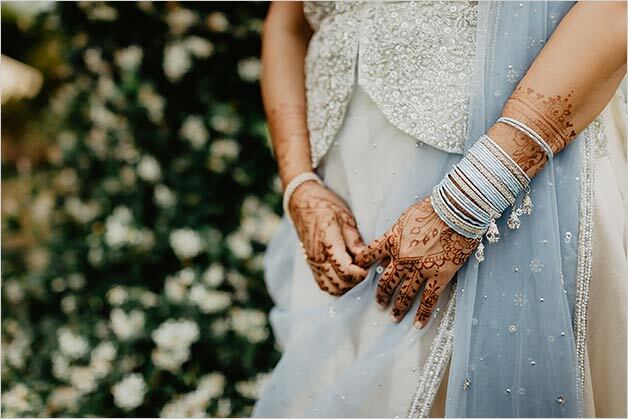 On the day of the wedding photographers started to take amazing photos of the getting ready including some final touches to bridal henna, some great family portraits and some first look pictures of bride and groom. 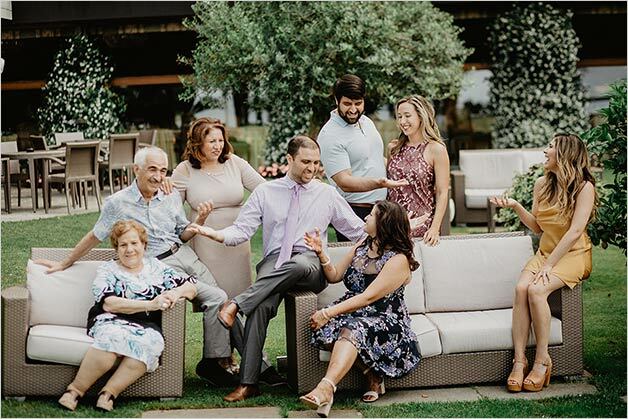 Then family of the bride could leave for the ceremony and reception venue. 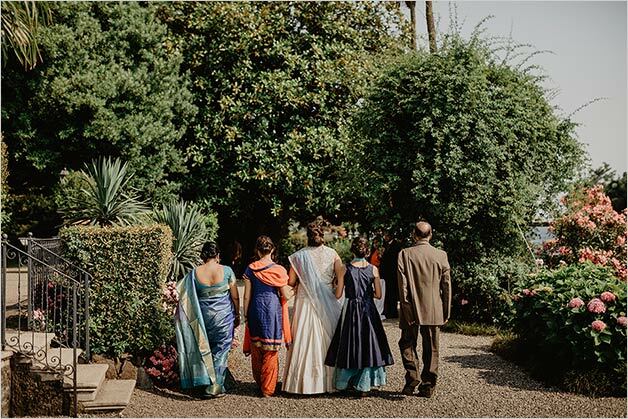 As per Indian tradition bridal family welcome the guests and the groom arrive in style! 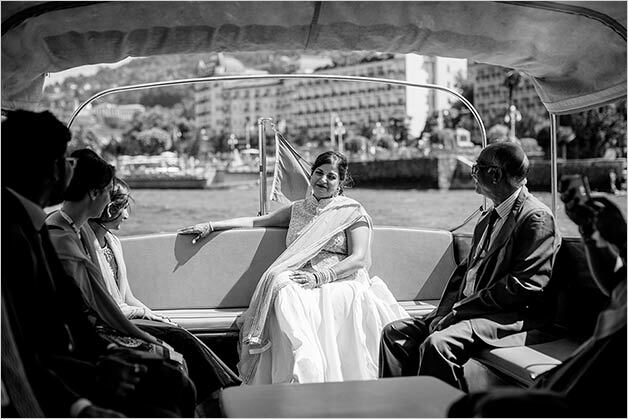 They did with a special entrance by boat! 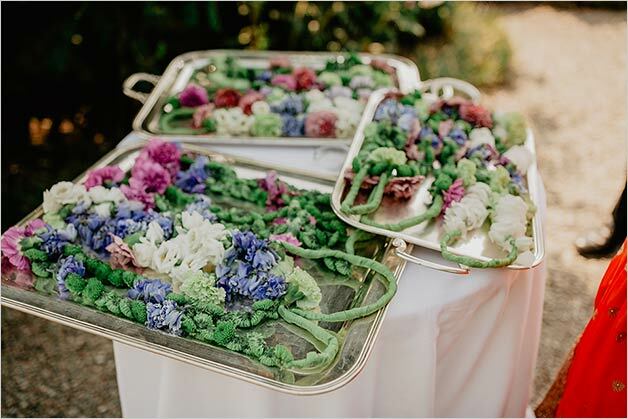 Bridal family welcome groom’s family with the exchange of the floral garlands. 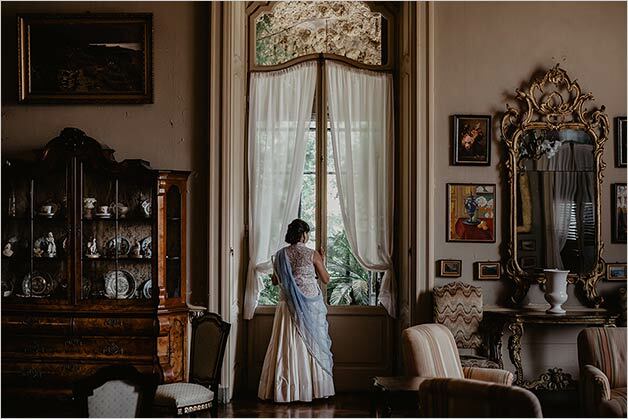 Amir and Neera chose one of the most beautiful wedding venues on Lake Maggiore for their special and unique wedding ceremony and reception to follow: Villa Rusconi Clerici. 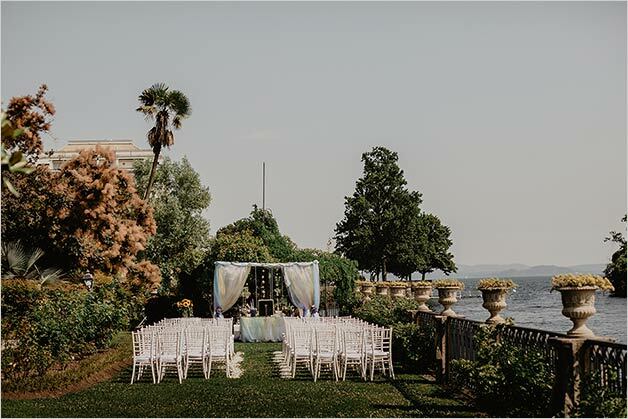 We created for them a special wedding ceremony set up in the side lawn of the villa by the shores. 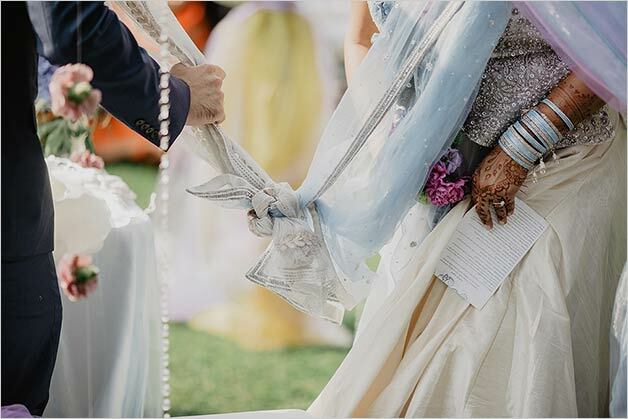 Lovely white chairs for the guests and most of all a wonderful Mandap with a rich Sofreh on foot. 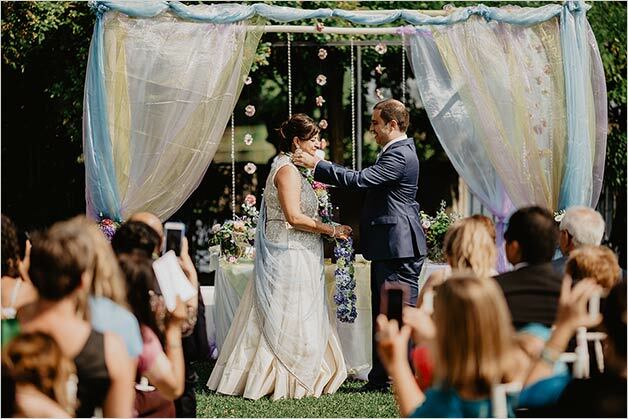 Mandap is the traditional canopy for Indian ceremonies and Sofreh is the traditional table full of traditional elements for Persian ceremonies. A perfect blend of two cultures. 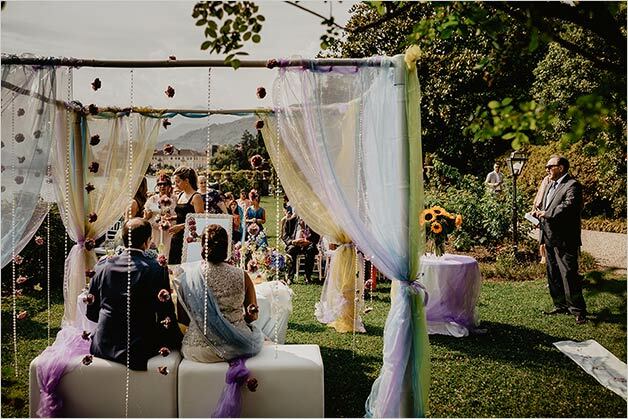 Neera wanted bright colours for the Mandap and Sofreh so floral designer Stefania created a structure with yellow, blue and purple drapes. They were all in a light tone. 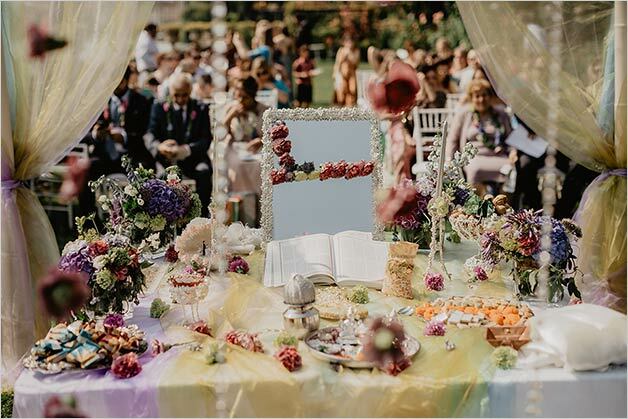 On the Sofreh table floral decor and all the traditional items to use for the Persian ceremony including two big pieces of sugar to spread on bride and groom’s head to bless them and honey for bride and groom to share during the ceremony as Persian tradition wants. 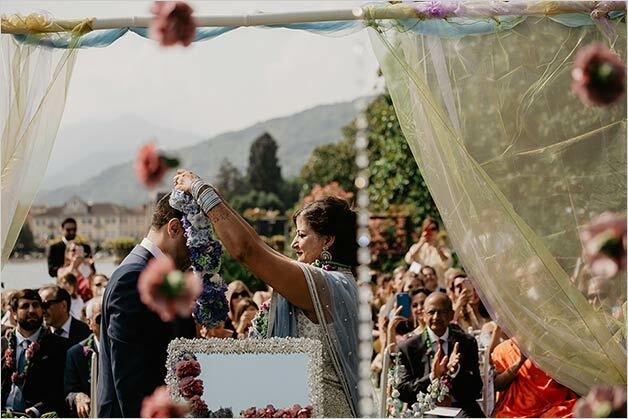 At the end of the ceremony Neera and Amir exchanged a floral garland to symbolise their union as Indian tradition wants. 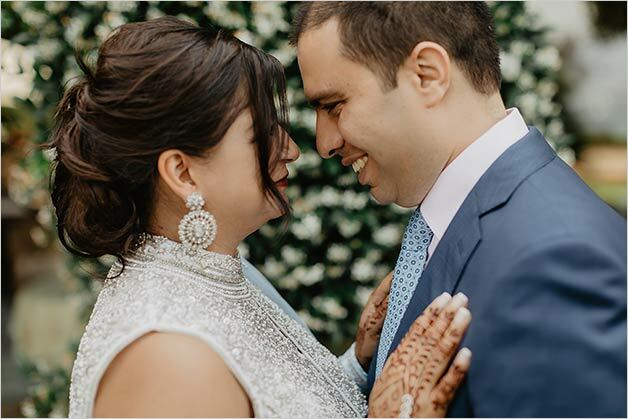 The mixed Indian Persian ceremony was performed by two members of Amir and Neera’s family and for us was a wonderful experience to live and share with this lovely couple. 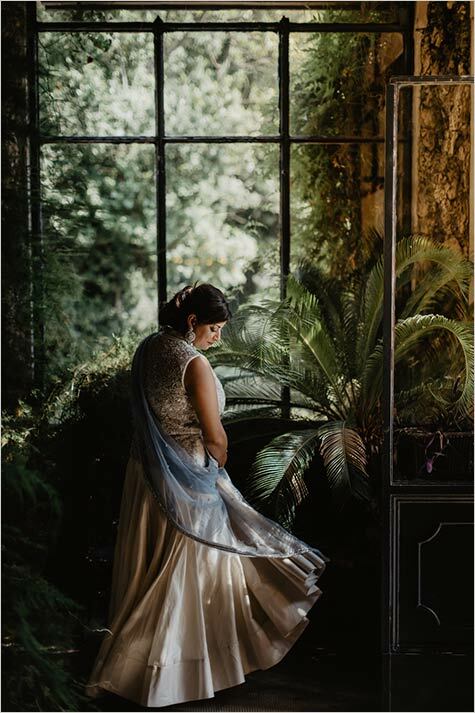 After such a unique and exciting Indian Persian wedding ceremony bride and groom took the change to take some wedding photos. 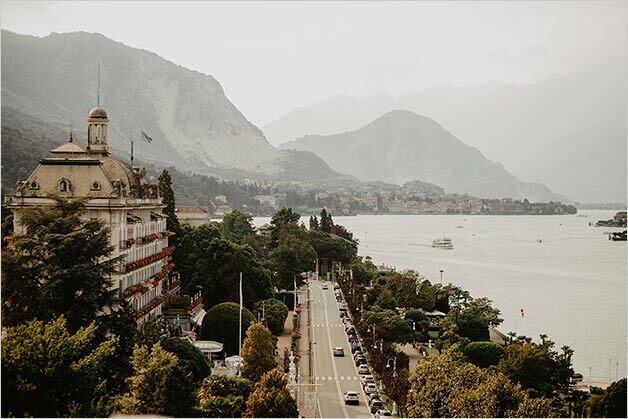 David Bastianoni and his team took perfect shots! 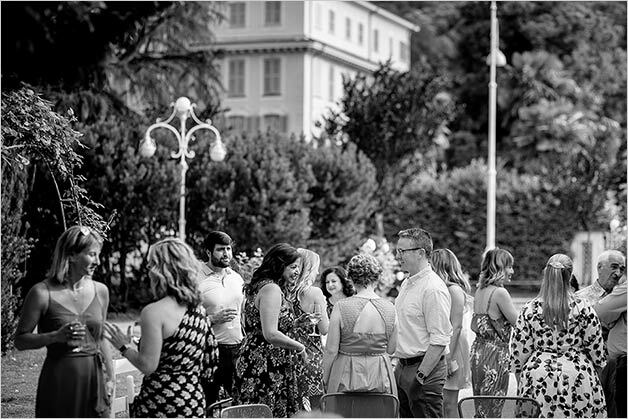 A rich aperitif welcomed all guests in the big lawn of the villa overlooking the lake and Borromeo Islands. 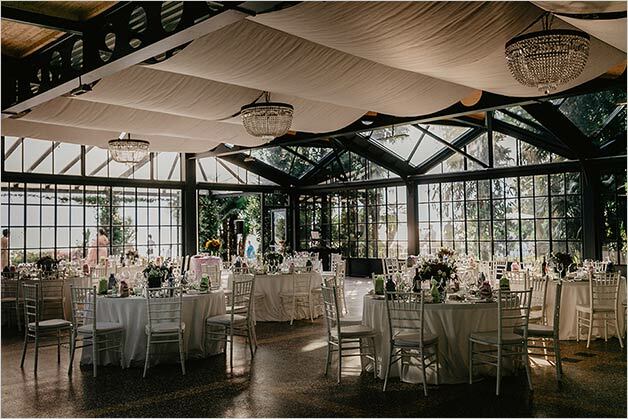 Then wedding dinner could start under the charming pavilion of Villa Rusconi Clerici. 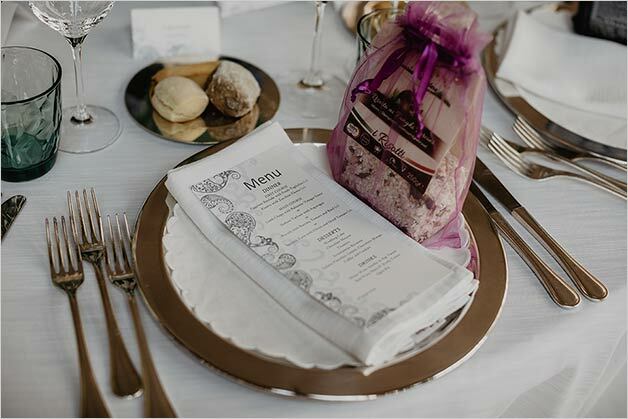 All the group tasted wonderful dishes accompanied by Italian wines and each guest receive a very special gift from the couple a little bag of Risotto with mushrooms to take home in colourful organza bags. 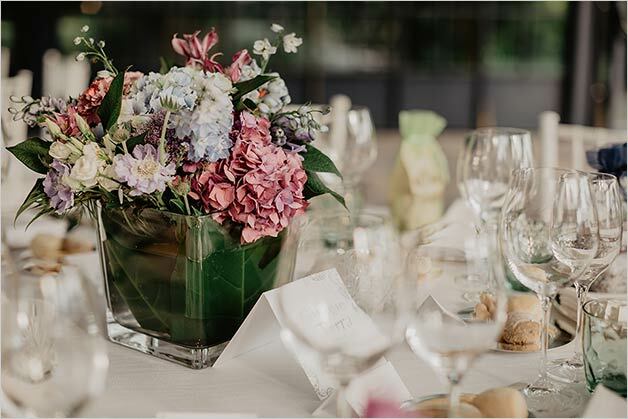 Flowers on the tables matched perfectly shades Neera chose for the wedding ceremony. 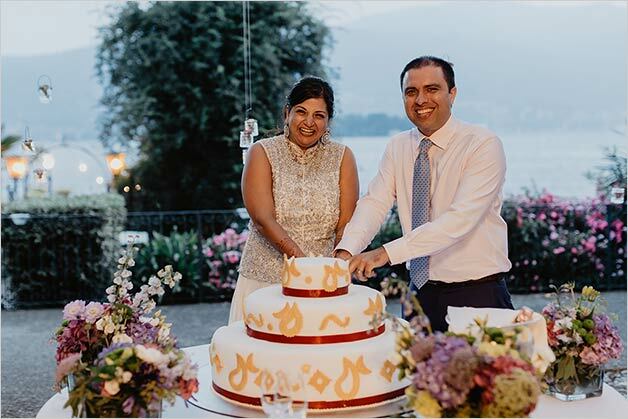 At the end of the dinner Neera and Amir cut their wonderful wedding cake decorated with Indian elements as Neera wanted. It was delicious too! 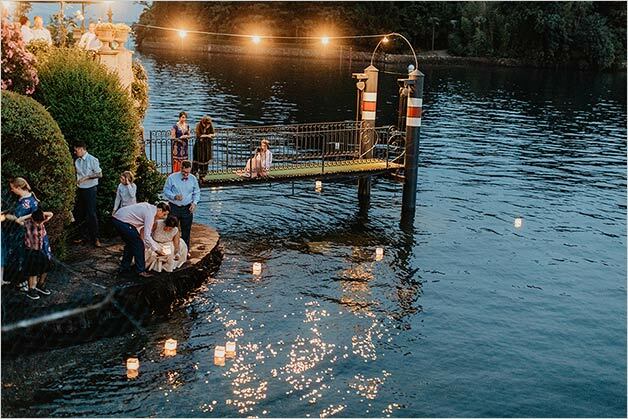 Then we planned for the group the release of romantic floating lanterns on the lake as wish to newlyweds! Party could start! 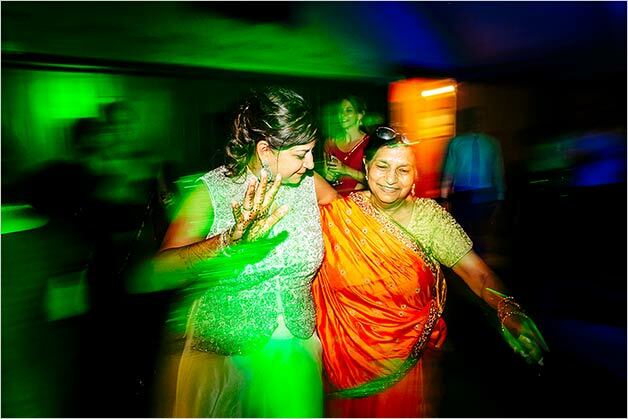 Indian, pop, rock and dance music made everybody dance! 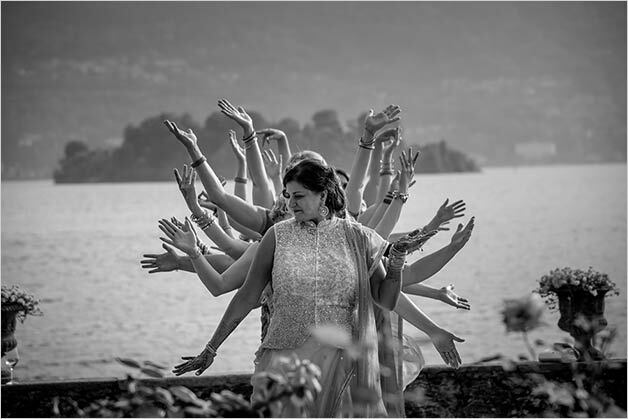 What a great Indian Persian wedding night for Neera and Amir on Lake Maggiore! 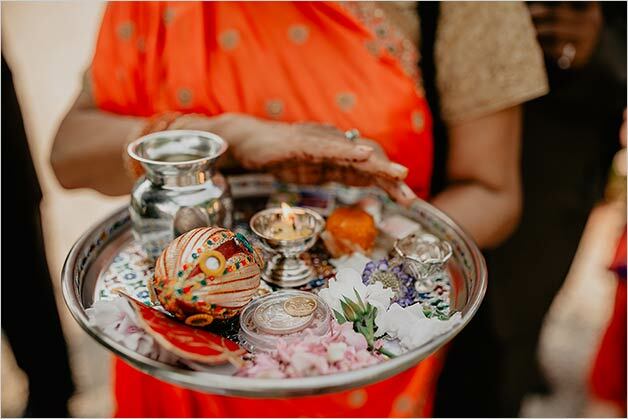 We feel lucky to witness such a unique union of two different culture. 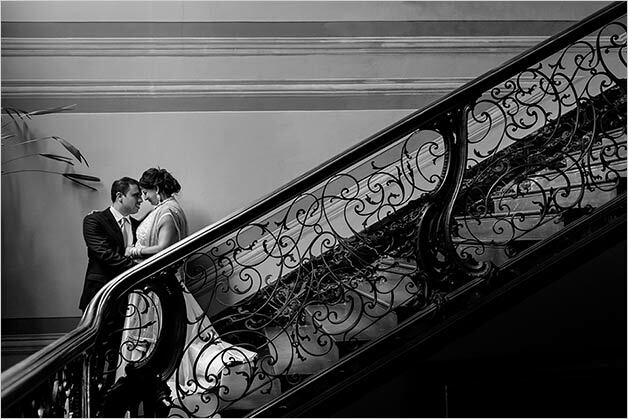 A wonderful planning for a lovely couple. 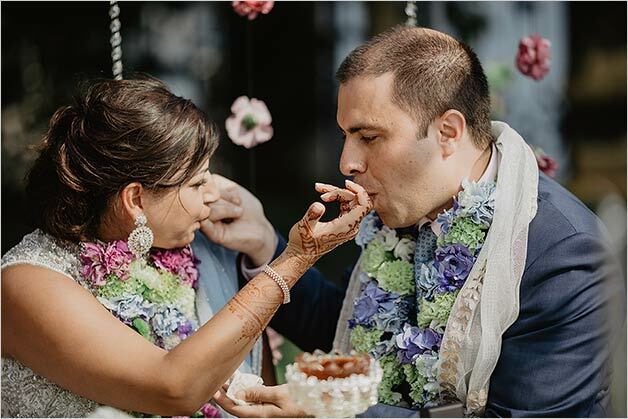 Amir and Neera you wedding will be remembered forever! 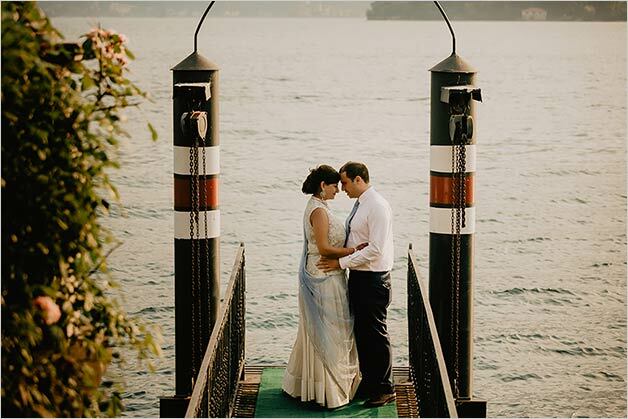 ← What Wedding Dresses Are the Most Suitable for Lake Weddings?